WASHINGTON — The Supreme Court Monday struck down the Professional and Amateur Sports Protection Act (PASPA), laying the groundwork for legal sports gambling across the United States. While the landscape could shift very quickly in a number of different directions, one thing is for certain. “It will be chaos,” attorney and sports gaming expert Daniel Wallach told WTOP. New Jersey is the immediate winner, and will be able to enact legal sports gambling within the next few weeks. Several other states, including West Virginia and Pennsylvania, have already passed laws dependent on the outcome of the Supreme Court case. Wallach said he believes they could both have operational sports books in the next 2-3 months. Another 15 states have introduced laws to try to take advantage of the gold rush. Maryland is not one of them. A measure to put the issue on the ballot this year passed in the Maryland State House, but died in the Senate. Unless a special session is called this summer to handle the issue, sports betting will likely have to wait until the 2020 ballot to reach legal status in the state. If and when that happens, and if Congress hasn’t established federal laws by then, Live! Casino will be ready. “We would be prepared to commence sports betting pretty much immediately after the passage of the implementing legislation by the state of Maryland,” Joe Weinberg, CEO of Cordish Global Gaming, told WTOP. Because of the way PASPA was written, and because of the way it was overturned, there is still an open avenue for Congress to outlaw sports betting entirely. It could pass a nationwide sports betting ban, pre-empting the individual state laws. All the decision said is that it cannot direct states how to act against their own will by preventing them from making their own laws (known as the anticommandeering doctrine). In the absence of an actual federal law prohibiting sports gambling it will be up to each state to decide how to regulate the industry for themselves. “Congress can regulate sports gambling directly, but if it elects not to do so, each State is free to act on its own,” Justice Samuel A. Alito Jr. wrote in his majority opinion. Whichever direction Congress chooses to go, Wallach anticipates it will have to get involved at some point in the near future. 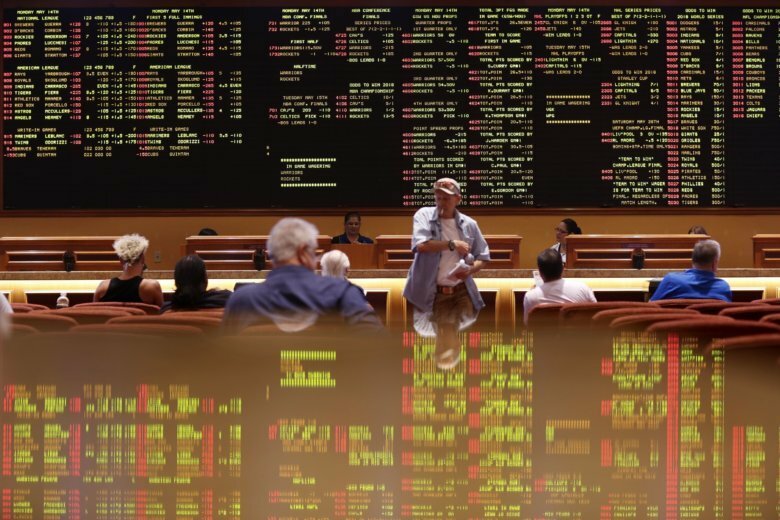 Unlike self-contained gaming at tables and slot machines within casinos, sports gambling can cross state and international boundaries, involving multiple municipalities. A uniform set of guidelines and protections will likely be needed to stave off potential legal issues this poses. In fact, the NFL called on Congress Monday afternoon to step in and create a national framework. “When you’re dealing with match-fixing, that has cross-border potential and worldwide ramifications. Inevitably, this is going to end up on Congress’s agenda before the end of the year,” Wallach told WTOP. Chairman and CEO of Monumental Sports & Entertainment Ted Leonsis has been one of the most vocal supporters of legalized sports betting. He delivered the opening remarks at the Sportsradar conference, but it was his later, impromptu statement in the middle of another panel (which was not included in the event’s wrap), that proved far more instructive of his vision for the future of in-arena gambling. Leonsis’ address followed a deflection from Spillane regarding how the NBA in particular would handle in-arena gambling. “We haven’t talked about that yet,” Spillane said. Leonsis grabbed the mic and laid out a scenario in which Capital One Arena would offer betting windows and even attendants who would come straight to your seat to place wagers. Fans would, theoretically, be able to bet on aspects of the game being played in front of them, as well as others taking place around the country or world. They wouldn’t even have to attend the game – they could just walk up to a window at the arena and place a bet from the outside. While D.C. has a lottery commission, it doesn’t have existing casino infrastructure or laws on the books to deal with such scenarios yet. There is a provision against sports betting that would have to be repealed. Will this lead to corruption and match fixing? For this arena, England serves as a model to allay concerns of potential match-fixing at the professional level. The age of big data allows companies like Sportradar (which held a summit on Capitol Hill last November) to monitor regulated betting action in real time and identify potential spikes in irregular betting patterns. In addition, the salaries in major American professional sports are high enough to dissuade match fixing for smaller sums on the side. However, the same cannot be said for college sports. “College sports is the one realm where corrupters can influence athletes, because they’re not paid market rate,” Ryan Rodenberg, a sports law professor at Florida State, told The Washington Post. In Europe, much of the worst corruption comes at lower-level tennis matches, which don’t impact the top players. One could foresee a similar issue at the college sports level in America, potentially impacting athletes not looking at a professional playing career. Several years ago, a mid-major running back fumbled intentionally in a game for just a $500 payoff. As the NCAA continues to fight not to pay its athletes, and as potential payoffs rise with the influx of gambling money, it’s easy to see where those types of situations might arise more often in the future. One of the strongest arguments for legalized sports gambling is the availability of new taxable revenue for the states from formerly offline wagers now placed legally. There is a limit, though, on just how much of this new revenue stream could be taxed and still function. If the state’s cut is higher than whatever margin a bookie or offshore service is already taking, there is less incentive to move your bets into a legal marketplace. This could be an issue when it comes to leagues trying to take a royalty percentage of the action for themselves. NBA Sr. VP and Assistant General Counsel Dan Spillane espoused his concern about that on his Sportradar panel. “I would want to be careful about limiting things in a way that is just going to sort of encourage people to keep using the illegal services,” he said. The size of the illegal sports betting market is hard to quantify, with estimates ranging anywhere from $50 billion to nearly $400 billion. But even if it’s at the low end of that spectrum, legalization could well propel the market sharply upward. When television sent the poker boom soaring in the early 2000s, revenue in Nevada casino poker rooms spiked from about $58 billion per year in 2002 to nearly three times that ($168 billion) just five years later. A big part of that boom was driven by the online poker industry, which soared in the intervening years. It wasn’t until 2008 — when the Unlawful internet Gambling Enforcement Act was finalized to crack down on online poker, dissuading regular players — that Nevada’s poker revenue leveled off. It stands to reason that sports gambling could see a similar rise in popularity with easy legal access points both online and in arenas around the country. Like the lottery or casinos, gambling serves as a regressive tax — that is, a tax that costs everyone the same amount of loss, no matter their income. That disproportionately impacts poorer residents. The Supreme Court’s decision asks more questions than it answers. While states will rush to try to capitalize on the new access to potential tax dollars, it’s tough to imagine that the federal government won’t get involved one way or the other in passing a national set of regulations.